—Debra Halperin Poneman, best-selling Chicken Soup author and Founder & CEO of Yes to Success, Inc.
“Lisa Barnett has helped thousands access their Akashic Records and find the unique solutions that work for them. 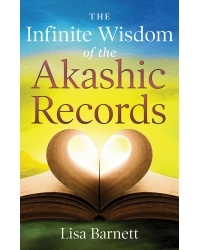 Now she’s taken her ability to teach others and created The Infinite Wisdom of the Akashic Records, making her knowledge about the Akashic Records available to readers everywhere. If you want to learn how to access the information that will help you make long-lasting changes to improve your life, this is the book to read. The art of formulating questions to receive life-enhancing answers. Releasing karma, soul contracts, and vows that bind you to negative life patterns. Gaining clarity about personal situations by practicing exercises. Learning new healing tools from the Akashic Lords to assist you in further releasing old issues and aligning with your life purpose. Author Lisa Barnett has gathered all her most successful techniques, strategies, shortcuts, and wisdom into this one book so you can do it yourself—anytime, anywhere. Lisa Barnett founded the Akashic Knowing School of Wisdom to teach six new Akashic Access Prayers to humanity. She has helped thousands of people from around the globe find greater fulfillment, happiness, abundance, and health by accessing their own Akashic Record. As an internationally respected Akashic Records Transformational Teacher, Lisa has more than 20 years of experience guiding people to energetic healing and higher wisdom. She teaches her dynamic and powerful short-cuts for accessing the Akashic Records internationally, locally, and via online workshops. Lisa lives in the San Francisco Bay area with her husband and three teenage children.